The dispute, which erupted in a hallway outside deputy chief of staff Joe Hagin’s office, was resolved after Sanders received the clarity she sought, the people familiar with the argument said. Hours later, Sanders returned to her lectern to field queries from a skeptical press corps, though her answers still left reporters with more questions. The moment illustrates the precarious role Sanders has chosen to fill as the public face of the Trump administration — and the doubts about her credibility in representing a president who proudly traffics in mistruths and obfuscations. Sanders was thrust into an especially harsh limelight over the past week. She was the subject of an acerbic broadside about her “bunch of lies” by comedian Michelle Wolf at the White House Correspondents’ Association Dinner. Then she was forced to explain the seemingly inconsistent accounts from her, President Trump and his new personal lawyer, Rudolph W. Giuliani, about the hush money paid to adult-film actress Stormy Daniels. The week was punctuated by an onslaught of commentary about Sanders’s character. By virtue of her position, Sanders is inextricably bound in the mistruths of the Trump administration. She is a willing warrior for Trump, and her critics believe she should be held accountable for his utterances — from the untruthful to the racist to the sexist. Since taking office, Trump has made more than 3,000 false or misleading claims, according to an analysis by The Washington Post’s Fact Checker. By the time she took over as White House press secretary from Sean Spicer last July, the administration’s penchant for misleading the public at the president’s direction was well-established. At his very first press briefing, Spicer vigorously misrepresented the size of Trump’s inaugural crowds, soaring to national fame as a laughingstock. Those in Trump’s orbit argue that the attacks on Sanders have been more sustained and more personally vicious than those faced by press secretaries in previous administrations. 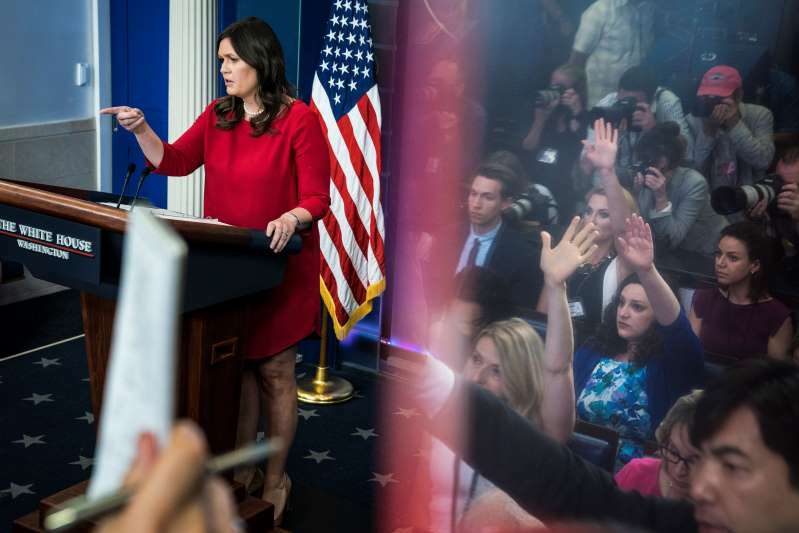 They argue that in a hyper-polarized nation — and amid the frenzied environment nurtured by a president who is at war with what he calls the “Fake News” media — Sanders has become an unwitting Rorschach test for the opinions of Trump’s critics. Reporters pressed Sanders on Thursday, was she a liar or simply in the dark? And why was the president’s personal attorney authorized to announce news about sensitive hostage negotiations? Sanders’ defenders say she spends considerable time crafting talking points that convey the president’s wishes but also are technically truthful. If she is guilty of anything, they say, it is providing incomplete information. She deflects nearly every question about the Russia probe, unless she has a prepared statement from the president to read — a protective move against creating legal exposure for herself with extemporaneous answers. During the Porter saga, colleagues say they frequently saw Sanders upset as she managed the fallout. She helped craft a statement that defended Porter and that later became an embarrassment to the administration. But, officials said, she was careful not to betray the administration’s missteps publicly like her deputy Raj Shah had when he said that “we all could have done better” — which attracted criticism from the president. “Sarah has always been coolheaded and professional and always gives our arguments for greater transparency and openness a respectful hearing,” said Olivier Knox, the chief Washington correspondent for SiriusXM, who will assume the presidency of the WHCA this summer. Last Saturday night, she sat next to Knox at the head table for the correspondents’ dinner. She did not stand up to congratulate the journalists who were presented awards — including a team from CNN, which Trump has assailed as “fake.” And as Wolf mocked her, joking that she “burns facts, and then uses that ash to create a perfect smoky eye,” Sanders sat stoic.